Alex Constantine's Blacklist: Author of Muslim Mafia, Endorsed By Rep. John Shadegg, Uses Fort Hood Tragedy to Rally "Backlash Against the Muslim Community"
Author of Muslim Mafia, Endorsed By Rep. John Shadegg, Uses Fort Hood Tragedy to Rally "Backlash Against the Muslim Community"
​The author of the book Muslim Mafia, which received a glowing endorsement from Arizona Congressman John Shadegg, is using the tragedy at Fort Hood, Texas, last week as a battle cry for a "backlash against the Muslim community and its leaders." Hold on -- that's just the beginning. In an interview with the group Family Security Matters, one of the book's authors, David Gaubatz, had some choice words for the Muslim community and its leaders. "Now is the time for a professional and legal backlash against the Muslim community and their leaders. Muslims know what materials are being taught in their mosques, and they know many of the materials instruct young Muslims to kill innocent people who do not adhere to Sharia law. If Muslims do not want a backlash, then I would recommend a "house cleaning." Stack every Saudi, al Qaeda, Pakistani, Taliban, Hamas, and Muslim Brotherhood piece of material from their mosque and have a bonfire." 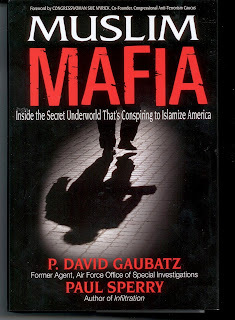 In the book, Gaubatz and co-author Paul Sperry claim that the Council on American Islamic Relations, a Muslim advocacy group, is conspiring to infiltrate the highest levels of American government via interns strategically placed within important government agencies. As ridiculous as that may sound, you might remember that just last month, two Arizona congressmen apparently drank the Muslim Mafia Kool-Aid. Congressmen John Shadegg and Trent Franks -- with the help of conservative pals Representative Sue Myrick, who actually wrote the forward for Muslim Mafia, and Representative Paul Brown, of Georgia -- called for an investigation into Muslim interns working in government agencies after claiming to find an "internal memo" cataloguing CAIR's plan. Shockingly, Shadegg's office didn't return our call to see if the endorsement still stands.